A calming aura fills the Juliette and Chocolate Restaurant along the Rue Saint-Denis in Montreal, Quebec in Canada but trying to find a seat to enjoy the beverages and snacks can sometimes take a while. Desserts are made to perfection and the taste of the chocolate delicacies are amazing. The meals served are also delicious, but for those chocolate lovers, this restaurant makes it hard to only order one thing. 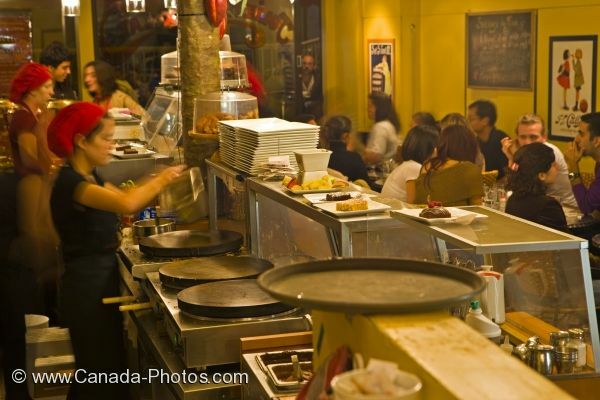 Interior of Juliette and Chocolate Restaurant in Rue Saint Denis, Montreal, Quebec, Canada. Picture of chocolate lovers enjoying the delicacies at the Juliette and Chocolate Restaurant in Montreal, Quebec in Canada.